Like any career, professional translation has its own set of misunderstood vocabulary, terminology, and processes. For example, translators work with written words; it’s interpreters who use the spoken word. If you’re interested in learning more about the difference between translation and interpretation, we invite you to visit Common Misconceptions About Being a Professional Translator. And if want to learn more about translation terminology to streamline communication with your translators, read A Helpful Guide to Translation Terminology. Even more complicated for non-linguists, there are also different categories our work falls into – the most common being one of the 4 Ts: Translation, Transcription, Transliteration, and Transcreation. As professional translators, our job is to transfer intent, meaning, and energy from a document’s source language to the target language. To do this, however, we may have to use one or more of three elements – transcription, transliteration, and transcreation. By understanding a little bit more about what each one is, and how it will – or could – come to play in your future translation projects, your conversations and strategic meetings with your translation team will be more efficient and targeted, with less time spent with the team explaining semantics or intent. The process of translation transfers the direct meaning and feeling (or essence) of the written word from one language to another. Notice the inclusion of “feeling” and “essence” there? As you can imagine, those two frequently make a big difference compared to simple word-for-word replacements, which are based only on word meaning or definition. This idea is most obvious when we look at idioms (words, phrases or expressions that mean something other than their literal translation). A comprehensive translation considers multiple factors, including meaning, grammar, contextual meaning, and cultural sensitivities. Let’s take an easy example: if you come across a part of a story where a character says “you are dead meat…” – that is not going to translate well into Spanish if you do a pure word-for-word substitution. In this case, “you are dead meat” means “you are a dead man”. So the translator needs to come up with an equally compelling expression (most likely a Spanish idiom) to capture that same energy or meaning. This is also the main reason why machine translations are never effective for high-quality translation work. Their tendency to perform black-and-white, literal translations (or word-for-word substitutions) means clients end up with “translated” products that are awkward at best, and completely confusing or even horrifying at worst. 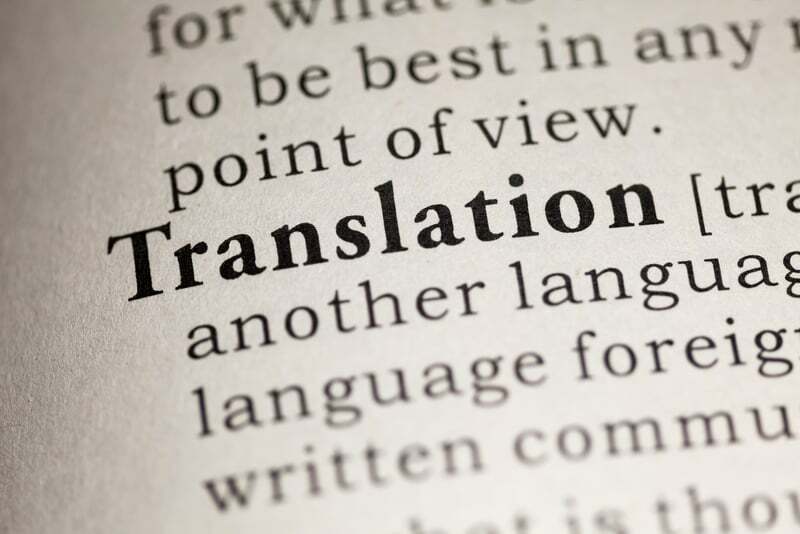 As professional translators, when we do our job well, translated documents are read smoothly and intuitively; they’ll “feel” as if they were written in the target language from the start, which is always the ultimate objective a professional translator wants to achieve. Transcription is the process of putting a sound recording into spoken words. In other words, it is the act of typing whatever is said in a video or tape in the same language. The transcript is the end result of that process. If you want to translate an audio or video recording, chances are you will first need to transcribe it before the transcript can be translated into another language. Transliteration has more to do with sound than meaning. Transliteration is used, for example, for a language that uses characters other than Roman characters (the ones we use to write in English). Japanese, Chinese, Korean, Russian, Hebrew, Arabic, etc. – all these languages may require transliteration, for instance, for an English speaker who cannot read foreign characters or alphabets. For example, in Japanese, the phrase good morning is written: おはようございます. Since your American executives probably can’t read hiragana, one of Japan’s written forms, we’d use transliteration to spell, Ohayōgozaimasu, so it’s at least legible to them in the script. Transliteration would also make it possible to write “good morning” in English using Japanese characters so a Japanese speaker could pronounce “good morning” in English just by reading the Japanese characters — but probably with a heavy accent and without understanding what they are actually saying. Transcreation is a deeper level of translation. It is a term used mainly by marketing and advertising experts and professionals to describe the process of adapting a message from one language to another language, while maintaining its intent, style, tone, and context – “localizing” the message to the country where it is going to be used. Advertisements, commercials, mottos, and slogans, which often use figurative language (metaphors, similes, analogies or colloquialisms) will typically require transcreation – a process that preserves everything that is conveyed by the written or spoken word that can’t be translated word for word into the target language without losing or changing its meaning or intent. Translation projects may require a combination of transcription, transliteration, and transcreation. Keep in mind that transcreation requires the largest amount of time and energy. If your document is full of colloquialisms because it strikes a conversational tone, it will probably require more time to translate than something that is more straightforward or technical. If this is a problem for you or your budget, work with writers or your in-house team to simplify documents before sending them off to the translators. It is also important that you, as a client, are very clear on any words or proprietary phrases, slogans, trademarks, etc., that you don’t want to be changed at all. These are the types of things you’ll communicate to the translators or, better yet, record in your glossaries and style guides. Are you ready to send your documents to professional translations of the highest caliber? Contact us here at Chang Castillo and Associates, and we’ll show you why we’re considered the best in the industry. You’ll feel the results in the immediately positive responses and engagements from your overseas clientele.